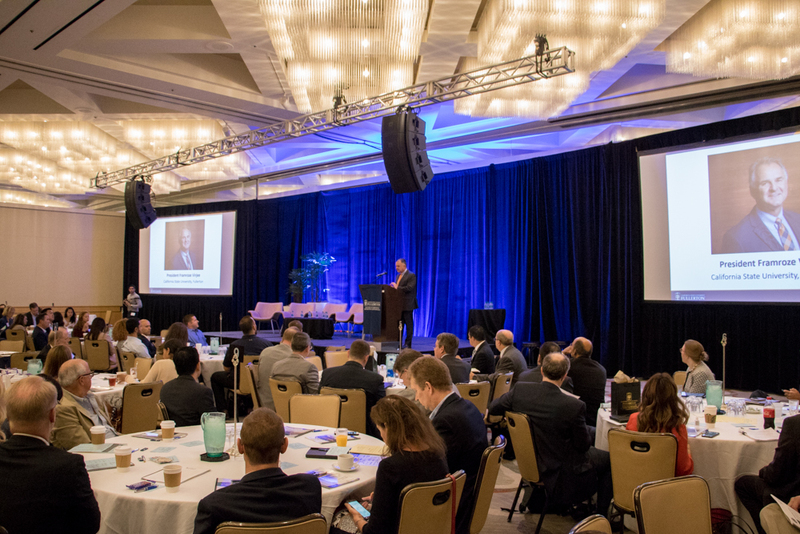 The 17th Annual SEC “Hot Topics” Conference, which provides regulatory and best-practice updates on legal and financial reporting for public companies, examined the technological, social, economic and regulatory trends transforming the field. The conference also provides continuing education for professionals and exposure to the industry for students and entrants into the industry. About 500 auditors, regulators, accountants, finance professionals, legal authorities and members of the academic community received updates on corporate reporting and governance from industry veterans at the SEC “Hot Topics” Conference. Keynote speakers at the sold-out event on Sept. 21 included SEC Commissioner Hester Peirce and Edwards Lifesciences Chairman and CEO Michael Mussallem. Sponsored by CSUF Mihaylo College’s Center for Corporate Reporting and Governance (CCRG), the 17th annual gathering of financial reporters focused on emerging opportunities and challenges for the field, including the impact of the Tax Cuts and Jobs Act of 2017, cybersecurity, blockchain and cryptocurrencies, technology-based regulation, and future audit practices. Through a live webcast, presented in partnership with CalCPA, practitioners from throughout the Golden State had an opportunity to gain continuing education through the event. Additionally, PollEverywhere, a survey software, facilitated increased audience involvement and discussion between speakers and attendees. Cal State Fullerton President Fram Virjee addresses attendees at the SEC “Hot Topics” Conference, a continuing education forum for industry leaders that also offers professional development for students and entrants into the field. 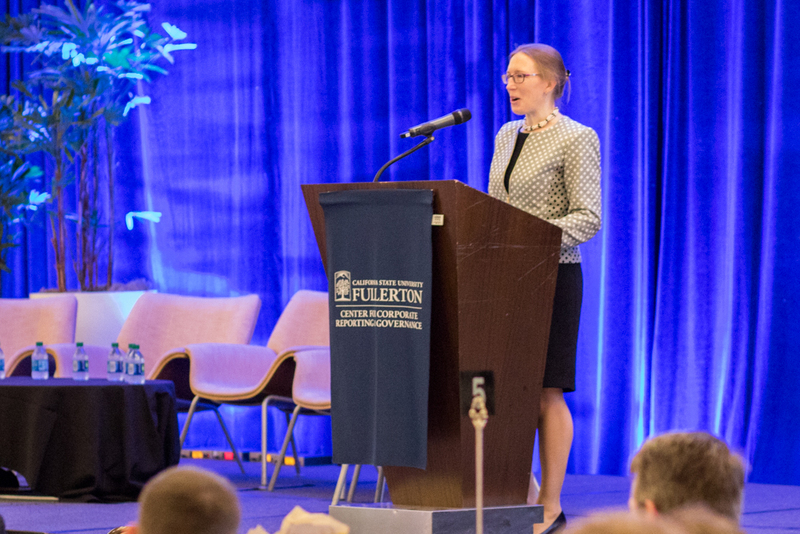 Following opening remarks by Cal State Fullerton President Fram Virjee, SEC Commissioner Hester Peirce discussed her views on balancing the needs and demands of shareholders, who have a monetary interest in a firm, and the broader society that may be impacted by corporate decisions. Michael Mussallem, chairman and CEO of Edwards Lifesciences, countered the assumption that technology will replace humans in the job market, instead arguing that technology is facilitating work and opening new positions in many fields. He encouraged professionals in all fields, including accounting, to consider new ventures. The SEC conference not only supports the continuing education of professionals in the field, but also provides networking and development opportunities for Mihaylo College accounting and finance students. In addition to planning the event, student attendees, including representatives from the Accounting Society, Association of Latino Professionals for America (ALPFA) and Beta Alpha Psi (PSI), gained from the perspectives of industry speakers. About 50 CSUF faculty and professors from other institutions, including Cal Poly Pomona, UC Irvine and USC, as well as students and volunteers, were also part of the event. For more on CCRG, including the center’s academic conferences and opportunities for industry involvement and development, visit them online or at SGMH 4357.